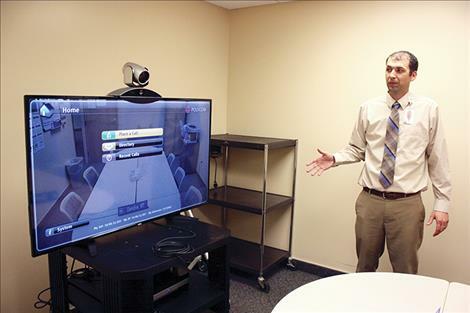 Glendive Medical Center CEO Parker Powell shows off the hospital’s telemedicine system. For the past few years, the hospital has used telemedicine via video to provide mental health services for patients. When Mary Hutton first moved from Kansas to Eastern Montana over 10 years ago, she was at a loss. Living in Baker, a town of 2,000 about 12 miles from the North Dakota border, she had almost no access to mental health resources, not for her own post-traumatic stress disorder and not for her son’s autism. The closest services were in Miles City, an 80-mile trip that takes over an hour to drive. She said she made the journey every week or every other week for counseling. During the winter, the time in between trips would be longer. She had no family or support system to help with the kids. She felt isolated. “I would have breakdowns all the time … there’s a lot of yelling involved when you’re having meltdowns, and then a lot of apologizing to your kids afterward,” she said. Hutton’s story is not uncommon. In a state where all but one county is designated a mental health shortage area, Eastern Montana has it especially bad. Between Billings and Bismarck, Glendive is the only town that offers a psychiatrist -- a doctor who can provide medications for people in need of mental health services -- and she only works part time. In this part of the state, where the plains stretch to the horizon and the roads are ruler straight, many people look to telemedicine to receive mental health services. Typically, these services are offered through the Eastern Montana Telemedicine Network, connecting patients in rural clinics and hospitals to specialists from the Billings Clinic via video feed. In the past year, nearly 2,000 patients in Eastern Montana, North Dakota and Wyoming sought mental health services throughout the network’s 29 partners. The region is no stranger to telemedicine. Thelma McClosky has been director of EMTN since its inception in 1993, when video conferencing equipment was bulky and cost $65,000. Billings Clinic was one of only ten hospitals in the nation to try out the revolutionary approach. In the past five years or so, McClosky said a perfect storm of events has led to a surge in telemedicine utilization. The technology has gotten better and cheaper; more studies have been done on its efficacy; changes in reimbursements and a transformation in how people think about health care delivery. “From my perspective, the power of telemedicine is that you can get a resource no matter where you live,” she said. The cost of time and travel can be extraordinary, she said. Some patients who use telemedicine would have to travel 365 miles to get the same services at Billings Clinic. According to the program’s 2017 annual report, patients saved an estimated $1.2 million in out-of-pocket expenses that would be spent on traveling for mental health services alone. Because patients don’t have to take large chunks of their day to travel, they are more likely to show up for follow-up appointments and maintain continuity of care, which can be vital for people’s health, McClosky said. Glendive is one of many towns that have made use of telemedicine. Sidled up next to the Yellowstone River, it’s known best for its Creationism dinosaur museum and fossils that can be seen while hiking the badlands of Makoshika State Park. The town’s three radio stations offer a mix of country music and Christian sermons. About 5,000 people live here, but at the moment there’s just one part-time psychiatrist who works out of private practice. Throughout the years, Glendive Medical Center has struggled to retain mental health services. In 2011, when they couldn’t recruit anybody, leadership sent a family practice physician to Seattle, Washington, to train as a psychiatrist. When he came back, he ran a four-bed mental health unit, receiving patients from 23 counties. It didn’t last long. When the newly trained psychiatrist left just two years later, the hospital discontinued the mental health unit altogether. So, in 2015, the hospital hired on Dr. Ana Stan, who provides psychiatry services through telemedicine from the comfort of her home in Bozeman. Hospital CEO Parker Powell said Stan has provided an important stopgap. Even if they can only offer outpatient services and there are fewer patients as a result, he said his main concern was ensuring any kind of access to mental health care. Recruiting psychiatrists can be a fool’s errand in Glendive. When people from outside the state think of Montana, they think of mountains, not plains, he said. Stan, who first trained as a doctor in Romania and had recently moved to Montana from Dallas with her husband, said she probably wasn’t going to live in Glendive. Just now, five years after closing down the mental health unit, they found a psychiatrist and two mid-level providers to reopen this summer. It will still be only four beds, but it should provide much needed relief for an area starved for options. With multiple providers, and another on the way, Powell is hopeful that the unit won’t fall apart again when one person leaves. But Powell said the hospital still won’t be able to provide psychiatry services for anyone under 18. Recruiting a general psychiatrist is hard enough; getting a pediatric or adolescent psychiatrist would be akin to a quest for the Holy Grail. Glendive resident Christine Whitlatch said she has used telemedicine for her 17-year-old adopted son who has struggled with mental health issues his whole life after being born in drug withdrawal. She said telemedicine saves her the three-hour drive to Billings for medicine management, but “it’s just not as effective as the doctor sitting face to face.” That’s because a psychiatrist can identify and address potential issues through visual cues, even on routine visits. It’s one reason why Hutton, the mother who moved from Kansas to Baker (and now lives in Glendive), won’t use telemedicine. While she’s had trouble finding services for her 15-year-old son, who was diagnosed with autism, ADHD and anxiety disorder, she said she wants a doctor to have a more personal connection with her son. So, for the time being, she makes the drive to Billings so he can see a psychiatrist in person. Dr. Stan agreed to an extent (though she was never a psychiatrist for either Whitlatch’s or Hutton’s children). She said she might miss clues like general mannerisms, neglected hygiene and self-harm. “On my side it takes away from my connection to the patient,” she said. This means she has to rely more on the local staff to relay any information they see. In the case of Glendive Medical Center, there are nurses trained to look for these signs, so Stan has not noticed any problems yet. While some patients are more comfortable with an in-person connection, Stan said that others are relieved that she doesn’t live in the area. In a small town like Glendive, they can rest easy knowing that they won’t see her at the grocery store or the gas station, and are more willing to share information with her. Only so much can be done through telemedicine, though. Whitlatch said if her son needs more inpatient psychological treatment, she still has to make that drive to Billings. One time, when her son needed immediate inpatient care, she went as far as Arizona when Shodair Children’s Hospital in Helena had a waiting list stretching for several months. Arizona had the closest hospital that could serve her son’s needs and that would accept Montana Medicaid. After living in Glendive for five years, Whitlatch wrote in an email that she and her family would be moving to Billings this summer to better meet her son’s needs. In Billings, there is an active National Alliance on Mental Illness group, a mental health center that can help her son as soon as he turns 18 and a crisis intervention team. Not to mention that they will no longer have to make that three hour drive. EMTN Director McClosky admits that telemedicine is not for everyone, and that it isn’t the right option for every visit. Doctors and patients alike should use their judgment to make decisions that will result in better health outcomes, she said. “My thing with telemedicine is it’s another tool,” she said. Some of her patients barely have the resources to make a 30-mile trip to Glendive Medical Center, let alone the journey to Billings. She talked of one middle-aged patient, who lived with “very, very sparse means” and who has suffered from mental illness since his early 20s.